We are moving from Switzerland back to the US. This is our third year in a row (and fifth time in six years) that we are moving to a different country. And yet again, we will have to live out of suitcases for a month or so while we wait for the container with all our household belongings to arrive at our new home. Exactly a year ago, we moved from Washington DC to Switzerland. It was supposed to be an easy trip – a quick flight from DC to Newark, then a direct flight from Newark to Zurich, and finally an hour train ride to Basel (where we’ve lived for the past year). However, the flight from DC was delayed by over 8 hours and we didn’t arrive in Newark till almost 1am, missing our 8pm flight to Zurich by a long shot. The four of us, plus our dog, had to make our way to a hotel in Newark in the middle of the night – and then up early for a flight on a different airline the next morning. Of course, none of our luggage made the transfer – so we had to spend our first three days (including my son’s birthday) in Switzerland without any fresh clothes to wear. Oh yeah, it was a holiday as well. August 1 is not only my son’s birthday, it’s “Swiss National Day” – equivalent to the Fourth of July – so no stores were open anywhere for us to buy some new clothes. Not even grocery stores were open. 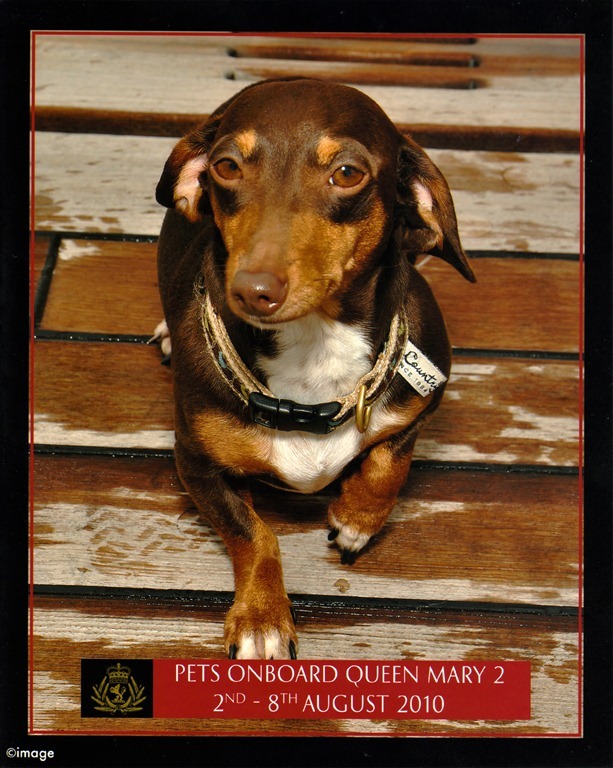 When we purchased the tickets on the cruise over a month and a half ago, we booked for two adults, two children, and a dog (Cunard just happens to be the only cruise line with kennels on board, and they made it very easy to bring our dog Sally along with us). We got a very good rate on the tickets, and I think we got the very last two cabins on the ship. So far so good. WHAT THE HECK????? We freaked out, of course. This wasn’t a vacation for us – we were moving, and the cruise was our transportation home. We had already rescheduled the movers to accommodate the dates of the cruise. We had already purchased non-refundable tickets from Switzerland up to the UK, which is where the cruise was departing from. I had already pre-paid for two nights in a hotel in the UK (also non-refundable). We had jumped through hoops to get all the necessary paperwork together to get our dog into the UK. It was very stressful. Our only other option to get home was to find a flight for the four of us – but the “last minute” airfare was more than double what it would have cost if we had purchased the tickets a month and a half ago (when we decided to take the cruise instead). In addition, there are only certain airlines which allow pets to travel in the cabin as “carry on” baggage, which further limited our flight options. It took us almost six days to get the problem straightened out. After many emails and phone calls (including a few conversations with Cunard’s legal department), we managed to get a VP of Princess Cruise Lines (Cunard’s parent company) to allow a waiver to the maximum number of children on board, and we finally got confirmation that our tickets would be honored. With the cruise reservations confirmed on Monday, we only had two more hurdles to overcome – getting our house packed up and cleaned by Friday afternoon, and getting ourselves to the UK on Saturday. The moving company did an excellent job with the packing and loading of the container (all day Wednesday and Thursday), and after a very strenuous day of cleaning on Friday we had our final inspection with the landlady and handed over the keys to our house on Friday afternoon. On Saturday morning, we departed for the UK. Once we booked the cruise a month and a half ago, I started on logistics to get everyone to the UK for our departure from Southampton. I then found out that the requirements for bringing a dog into the UK is very difficult, even for just a 24 hour “transit” on to the cruise ship. To bring a dog into the US, you only need current vaccinations and a certificate of good health from a vet. When we brought Sally into Switzerland, we needed to have a micro-chip injected into her neck – but we were able to get that done AFTER we arrived in-country. For the UK, there’s a whole laundry list of things to do. If you’re coming from an EU country, you need to get a special “Pet Passport” where the vet stamps all the shots and other treatments. You need the micro-chip. You need vaccinations. You need a blood test. You need heartworm medication. Everything has to be done in the correct order. However, Switzerland is NOT a member of the EU, and they’ve only just recently started using the “Pet Passport”. Switzerland is listed as one of the non-EU countries that is “rabies free”, so you can import a pet from Switzerland into the UK using an alternate method. You need to meet all the same requirements, but instead of having the “passport” you can do it with a vets certificate. So we got all the paperwork together and I thought we had everything in order. British Airways is one of the airlines that does not allow pets to travel on board, and there were no other flight options that day. So we had decided early on that my wife and kids would take a plane to London, and I would take our dog Sally on the train via Paris. Pets are welcome on almost all European railways, but for some reason they are NOT – under any circumstances – allowed on the Eurostar train, which goes directly from Paris to London via the tunnel under the English Channel. Even seeing eye dogs need to be de-clawed and have a special certification to travel on the Eurostar. The only option is to take a train from Paris to Calais on the northeast coast of France, and then a ferry from Calais to Dover, England. It makes for a long trip, as Dover is still over two hours from where we needed to go. I left Basel, Switzerland, at 8:00 in the morning on Saturday, changed trains in Paris, and arrived in Calais at around 3:00 in the afternoon. I took a bus to the ferry terminal, showed them my ticket for one human and one canine traveler, and the good lady at the P&O Ferry check-in counter said “where’s your Pet Passport”? I was flabbergasted. I argued and pleaded and talked to the supervisor. I explained that we were leaving on a cruise Monday morning. I explained that tomorrow was my son’s birthday. I had all the documentation that the UK required for a pet to come from Switzerland. All to no avail. No Pet Passport, no entry into the UK. I could, I was finally told, find a veterinarian to issue a Pet Passport and she handed me a piece of paper with the address of a 24 hour clinic in Calais. A 20 Euro taxi ride later, and I was at the vet. By this time it was after 5pm on Saturday. The veterinarian was VERY nice, and very sympathetic to my situation. She gave Sally a quick examination. She actually called our old vet in Washington DC (where Sally received her rabies shot) to get the manufacturer and batch number of the vaccine, which is required on the passport. She called our vet in Switzerland to verify all the other treatments. She ignored the fact that the rabies vaccine was actually done BEFORE the microchip was injected, which is punishable by death in the UK (ok, maybe not – but I’m sure it’s a major offense equivalent to calling the Queen a whore). I had the proper vaccinations. I had the blood test. I had the heartworm medication. Now I had the passport. The one thing I did NOT have was a flea and tick treatment, which has to be done no less than 24 hours, and no later than 48 hours, before entering the UK. The veterinarian dribbled a few drops of medicine on the back of Sally’s neck, made one more stamp in the passport stating she had received the necessary treatment, and I was on my way. Another 20 Euro taxi ride back to the ferry terminal, and I was told that all my paperwork was now in order – but because of the flea and tick treatment, I STILL needed to wait 24 hours before boarding the ferry. I almost told the kind gentleman that it was more likely that HE had fleas and ticks than my dog, but I managed to bite my tongue. The day wasn’t over yet. Now I had to find a hotel, and the ferry people were no help at all. “They’re probably all full” was the reply the supervisor gave me when I asked for a hotel recommendation. Bastards. I’ll bet he was going to go home and scratch at his fleas when his shift was over. I had to pay 2 Euro to get access to the wireless internet connection at the ferry terminal. I fired up Expedia and found a very nice hotel for a good price on the other side of town. This time it was 25 Euros for the cab ride each way. In total, the cost of the vet plus the hotel room was only just a little bit more than what I paid for taxi fares going back and forth. The flea and tick stamp in the Pet Passport was logged at 6:25 in the evening, so I had a whole day to kill on Sunday. Just me and my dog. It also was my son’s birthday. Exactly a year earlier, we were just finding our way around Basel, with no clean clothes to wear. Last year, in Switzerland, it was a holiday. This year, in France, August first was a Sunday. And anyone who has travelled throughout Europe will know that EVERYTHING shuts down on Sundays and holidays. I wanted to buy a few more birthday presents – but after an hour of walking around, the only two open establishments I found were a tobacco shop and a wine shop. I did buy a few bottles of wine, but nothing suitable for a ten year old’s birthday – so Sally and I walked back to the hotel. I delayed my checkout from the hotel as long as possible, and even then I sat in the bar area for an hour before calling a taxi to take me back, yet again, to the ferry terminal. After almost three hours of hanging around the empty terminal (absolutely nothing was open there, either), I looked again at the ferry schedule. The flea and tick treatment in the passport was stamped at 6:25 and my ferry was scheduled to depart exactly at 6:25. But it’s an hour and a half journey, and there’s an earlier ferry which is scheduled to ARRIVE in the UK at 6:20 (Paris time). I went up to the ticket window and asked if I could get on the earlier ferry. At first she said no, because the ferry docks FIVE MINUTES before Sally’s 24 hour waiting period was up. But I told her it will take at least 15 minutes to gather my luggage and get to the platform before I could actually step onto UK soil. She was much more friendly than the two people who were there the day before. She called her supervisor and presented my argument. Before I knew it, I was heading for security with a ticket in hand for the earlier boat! The P&O ferries are very nice. I had a sandwich and a beer in the pub. There was a large Duty Free shop and I was able to find some fun birthday presents for my boy. This was my first time crossing the English Channel by boat, and it was actually quite enjoyable. It was almost 9pm when I finally made it to Basingstoke, where we were staying for the night, so I got to spend the last three hours of my son’s birthday with him. 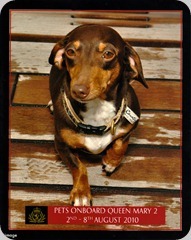 The next morning, we boarded the Queen Mary 2 in Southampton, and set sail for America. We are now three days into the six day trip, and I’m finally starting to relax a bit. We get to visit Sally three times a day. The kennel is run by a nice Philippino man, appropriately named “Rex”. Except for a bit of wind and fog, which makes it uncomfortable to be out on the exterior deck, it’s been a smooth trip. I’m really hoping we don’t have to move again next year. It would be nice for my son to be able to have a birthday at home, with friends, and not while living out of a suitcase in transit to a new home. And if we do move ever again, I’d like it to go smoothly without all these last minute difficulties. That’s not asking too much, is it? You must really love that dog! Well yes, and the kids too - after all, we could have just left them in Switzerland! Oh, David! I am so glad you will be back in the States. I hope we get to see each other again soon! Wish Gavin a Happy Birthday for me! Dave, this has all the makings of a Disney movie. I would work up a treatment and get it to an agent. Glad it all worked out. I hope Sally was really appreciative. Now I know what they mean when they say the "Dog days of summer." Bob Kaufmann told me of your problems. Don't worry, I will make them suffer. No matter. It's good to have you back. Your country needs you. By the way, how did your wife get through security. I was told that she was a reformed Muslim, and her mother is from Gotchastan.